Let's talk apostrophes. We all get it wrong from time to time, especially when writing, and thought and creativity is more engaged, than say, any desire to satisfy the minutia. It's not Elephant's Graveyard; it's the whole romanticised idea that elephants would collectively travel to some mythical single location to gasp their final breath; there's more than one. It's a small thing I know, but this small lack of attention is quite indicative of director and co-writer Harrison Smith's low budget zombie effort. For as taken as I was with the refreshingly modern and airy look and feel, and enamoured with the highly emotive characters and their story, I couldn't quite shake off all the small niggles and warts that combined to spoil the party. So who are the zombie killers? Well, they refer to the rag tag assortment of young waifs and strays tasked with protecting the isolated and fenced town of Elwood. Led with ruthless utilitarian zeal, Elwood under the leadership of Doc (Brian Anthony Wilson), an ex-military medic, has survived the fervent zombie contamination that has taken hold of the planet. 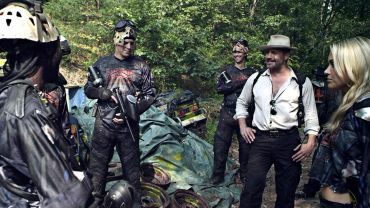 For six years, under the sub-command of Seiler (Billy Zane) these young adults have foraged, hunted and risked life and limb outside the safety of the compound to provide for the rather religious and insular group of lowlifes, who as we will discover, would be only too happy to thank them with a bullet to the back of the head should situation or occasion, like not keeping ones space tidy, demand. For a world ravaged by a multi-species zombie contamination, where society has collapsed, resources are scant and general subsistence has regressed to something akin to the stone-age you'd think people would have better things to do than paint ball or spread malicious rumour because it goes against rather wonky religious ideals. Yet that's what Zombie Killers Elephant's Graveyard is primarily about. It's not a tense or shocking survival thriller but a highly emotive character driven soap-opera where the very real zombie threat plays second fiddle to odd politicking and strange, almost sociopathic adherence to a disjointed dictatorial ideology; and though, as I've stated, it was genuinely refreshing to engage with something with a different take on post-apocalyptic living, it just didn't come together. 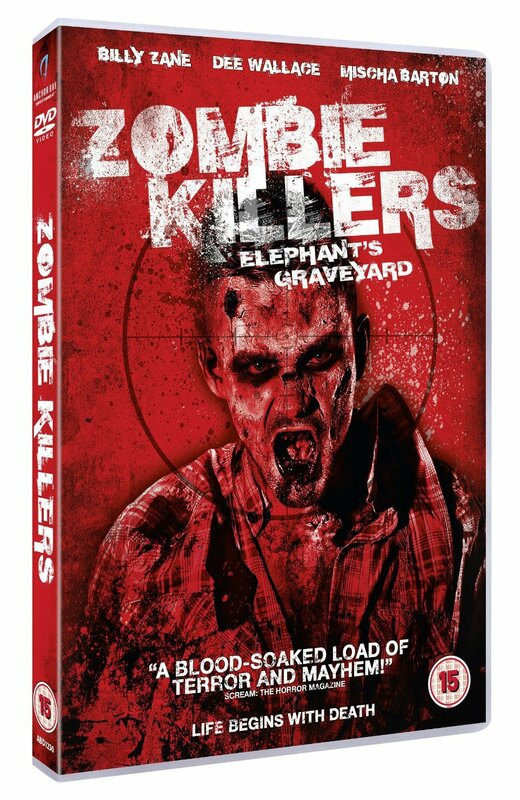 I won't spoil the Elephants' Graveyard bit save to say for an ingenious twist on a well-known myth, it wasn't the worst idea I've seen, and certainly garnered some much needed zombie attention just when it needed it. It's a symbolically extreme and audacious idea and that's ok. Unfortunately it also marks the point the film starts to fall apart as if there's a sudden shift in narrative to one where anything goes, and coherence no longer matters. Rather than using it as a tool to pull the surrounding narrative together, this tsunami of madness acts as a catalyst for characters to acts out and the story to descend in to farce which was all a pity. It's a parasitic, toxoplasmosis pandemic that's intimated to be of Proterozoic origin and has been thrown through time with fracking. In a candid and refreshingly glib post-zombie contemporary monologue which opens proceedings, we learn despite the best will of the uniting world, its swept mankind aside without mercy and this small band may well be all that's left. The some slow / some fast zombies are reasonably made up and realised, as would be expected in 2015 and though there's been an attempt to imbue them with fear, it all rather fails due to their rather comic spasmodic gait. As is now staple, it's the derivative bullet to the brain to stop them though as said, with their seemingly unlimited ammo and firepower it's not them one really needs to worry about. I can see what Smith was trying to do, and though the contemporary drama wasn't without charm the post-apocalyptic dystopia has fashioned characters that perhaps are just that too emotionally naïve and hyper-realised to feel plausible or congruous. There's an over simplification; a soap-opera immaturity and though Zane leads a cast who do adequately with what they have, all too often their characters behaviour comes across too extreme; either passive or otherwise, to believably carry the story they're central too. Sure I can understand someone contracting the virus, which Doc confirms with a blood sample, being evicted, and sure I can believe some bastardised reasoning, broken norms and twisted values and even eviction for seemingly minor indiscretions, but ruthless lieutenants more than happy to equate said eviction with totally detached murder is all a bit much. It's also all rather hampered by a convoluted soap-story which staggers in a rather derivative manner for an hour, only to spiral rather absurdly, in a way I'd more associate with The Asylum, to an unexpected, hectic and chin scratching finale, that again, doesn't do anyone any justice. 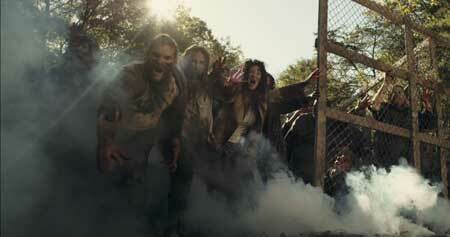 So, certainly interesting, entertaining and reasonably well shot, this low budget zombie TV look and feel melodrama isn't nearly as bad as reviews would lead you to believe, but also doesn't particular deliver the cohesive, authentic post-apocalyptic character driven experience early signs hint of - 5/10.